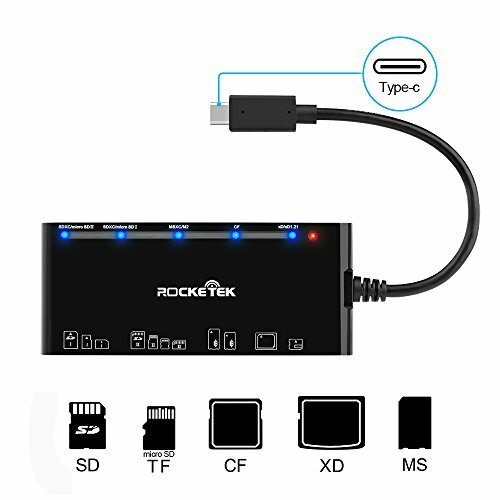 Rocketek RT-TCR7 Multi-in-1 Super Speed USB C 3.0 Card Reader allows you to easily add a USB C 3.0 multi-slot card reader/writer to your USB C 3.0 enabled system. The Rocketek USB C 3.0 SD / Micro SD / CF Card Reader is a great option for anyone looking for an easy way add support for the most common storage media types used in common digital cameras, MP3 players, and mobile phones,etc. 7 Media Slots - Support CF, High-Speed CF(UDMA), SD, SDXC(up to 2TB), SDHC, Micro SD, Micro SDXC, Micro SDHC, MS, xD Memory Cards. It is a 5 cards simultaneously, auto detect card memory, no driver needed usb card reader. Plug and play; Hot swapping; USB power (no external power or battery); Super speed USB 3.0 and backward compatible with 2.0/1.1. Independent LED indicator design; Build-in 13cm USB C 3.0 cable. Free lifetime technical support and free 18months manufacturer warranty.